Luke 22,14-23,56 about Jesus presentation of the New covenant. Going to Catholic Mass I asked myself for years what I was really eating. I came with time to an answer, I will share in the conclusions below. 13 They set off and found everything as he had told them and prepared the Passover. 14 When the time came he took his place at table, and the apostles with him. 20 He did the same with the cup after supper, and said, ‘This cup is the new covenant in my blood poured out for you. 21 ‘But look, here with me on the table is the hand of the man who is betraying me. Jesus bread wine metaphore has to be seen in a historical perspective. He used metaphores to give his audience a picture that helped to understand his message. So when he talked about bread and wine we must understand what people of tjhat time saw and thought about when Jesus talked about bread and wine. We know that bread was often a sourdough bread and it was not a food for everyone. In Rome it was important to give bread for free to avoid uprises and rebellions among the romans. We must remember that there were no sugar, no potatoes nor rice in the middle east. So bread was the main energy resource. Wine was a c-vitamine rich nourishment for the poor but a inhebriant for the rich people. We know from the greeks that wine was regarded as a drink of sincerity but for the Persians it was bad if consumed during important decisions. The disciples have heard this bread-body and wine-blood metaphore before and maybe undestood it in Jerusalem as Jesus explained it for a group of Jews in Capernaum. 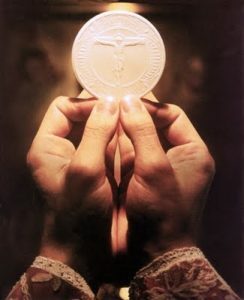 ‘Do not work for food that goes bad, but work for food that endures for eternal life, which the Son of man will give you, for on him the Father, God himself, has set his seal. ” the Jews started arguing among themselves, ‘How can this man give us his flesh to eat?’ The jews did not understand Jesus metaphore “I am the living bread” Do we? I have thought for years about Jesus “Eat my body” and “drink my blood.” After reading about Spinoza pantheistic view. I am still convinced that Jesus most probably also meant that the bread as any other food is the body of God. God materialized or incarnated according to Einsteins E=mc2. What did Jesus mean with “Anyone who eats this bread will live for ever;” ? If we do that then we show we believe in God and the message of Jesus. And like bread and wine we get energy and wisdom by listening to Jesus. I have experienced that many times in my life. And I am looking forward to met Jesus again after a resurrection. This eat my body drink my blood metaphore led me to make a few revisions to my “enlightened Genesis Creation Story” to make it a description about how God materialized as the Universe with the Human being as an image of God. I wanted to see how a pantheistic hypothesis would look like in a Creation Story described by a “pantheistic God”.